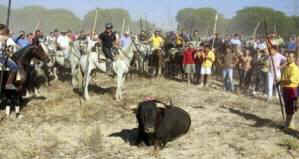 Twenty bulls have been “liberated” from the town of Tordesillas in northern Spain on the eve of a controversial festival in which the whole town hunts down a single animal with spears. The medieval festival has attracted widespread condemnation for its “savagery and brutality”, with anti-bullfighting party PACMA labelling it one of the “worst examples of animal abuse” in Spain. PACMA spokesperson Laura Duarte led the march past Spain’s ruling Popular Party headquarters. “The PP authorize this festivity in Castile and Leon and opposition party PSOE organize it,” Duarte told digital daily 20minutos. An online campaign launched by Spain’s Animal Dignity Platform has seen thousands of participants holding up signs with the message “I’ll take the bull’s place” as well them posting images of them symbolically breaking spears in half.